Dropbox 68 Million Client id’s leaked. Dropbox, cloud based data storage company says, some 68 million client id’s (out of 500 million registered users) were stolen 4 years back and are now leaked on the internet. Dropbox has confirmed that it was hacked in 2012. Hackers gained access to the login details of an employee and used it to get access to a file containing usernames and passwords of users. The company previously said that only email addresses were leaked, not the passwords. “This is not a new security incident, and there is no indication that Dropbox user accounts have been improperly accessed,” Patrick Heim, head of trust and security at Dropbox. Dropbox came to know about the leaked data when it was performing routine security check. Motherboard website says that it has obtained a selection of files which has email id’s and passwords of the Dropbox users through online sources in the database trading community. 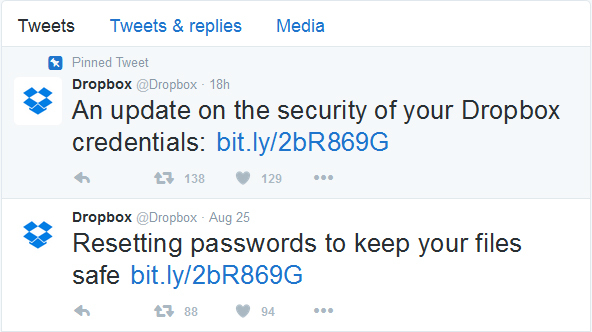 All users are advised to change their Dropbox account password. Previous article Instagram Introduces Picture Zoom-in. Next article Samar Khan Has Created a National Record In One Attempt.